Let's get together - we will be co-creating a breakthrough environment which will give freedom of energy, sustenance, healing and regeneration of the human vessel. Power your own home with Free Energy! Heal yourself and connect within with the technology! 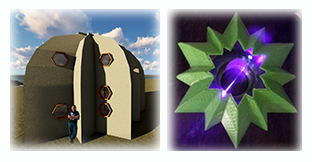 Get together to learn to make your own free energy devices for your own needs, health and connection within, in a group share experience. Trail blaze new horizons in the very interactions of the plasma, anti-gravitational and tesla based technologies', rediscovering the torsion field energy flow when experimenting with expanding consciousness in the making of your own future tech devices. We are now in the midst of fulfilling the prophecies that there will be no debt, nor lack, no hunger, no wars, no suffering in this world. Let us be part of the transition, from the old to the new. Our primary objective is to instil awareness, gather resources together to build our own Free Energy Devices for our own needs, health and connection within, whilst trail-blazing new developments in the futuristic technology beyond human intelligence. Secondary objective is to build skills, nurture a career in manufacturing, spin offs in cottage industries in the community, creating employment. Providing a platform for cooperation, sharing and caring, uniting all creeds and races, towards unity, peace and harmony working together for freedom and the betterment of humankind. Power your own home and life's conveniences with Free Energy! Heal yourself and connect within! Learn from or share and exchange knowledge/breakthroughs with fellow members to acquire or even to make your own free energy and healing devices and explore new frontiers with the fast advancing technologies in a group share experience. Please visit our channel and SUBSCRIBE to support this work. From time to time, we will have visiting plasma, anti-gravitational and tesla based technologies' developers & scientists from various other disciplines presenting their work and teaching at the FESIG Meetings with creative innovative ideas and theories that may have some varying thoughts. In our meetings everyone is welcome to speak and present their ideas and work. As Free Energy covers a wide big spectrum of discoveries with so many ways of experimentations yielding different beneficial results by its creative and innovative scientists, researchers and developers, FESIG will not be held responsible for anybody's misperceptions or judgement that could give rise to negative feelings of 'slight' or discomfort arising from their differing approaches, belief systems and claims. Different speakers/teachers' beliefs and methodologies may clash giving rise to misunderstandings as some may go against the grain of the other beliefs, or misperceived as loyalty being compromised to other theorists and teachers. It must be made very clear that FESIG, as an open-minded Futurist Freedom Seekers' group, hereby declare that we do not take a stand for or against any particular science or theory or spiritual belief and are open to all teachings/infomation shared, impartially (neutral, unprejudiced, unbiased) welcoming creativity that pushes science and spirituality to the furthest frontiers, in the pursuit of knowledge, seeking breakthroughs to succeed in our objectives of making this world a better place to live in. You shall utilize all TVoP/FESIG sites at your own risk. FESIG makes no representation regarding the Guest Speakers or other resources on the FESIG sites. FESIG does not make any guarantee to the accuracy or completeness of any of the information contained on the website FESIG is not and shall not be liable for any claim, loss, cost or liability that arises out of or relates to your use of the TVoP/FESIG sites. FESIG makes no representations or warranties in relation to the articles, guidelines, informational videos or other information offered via the TVoP/FESIG sites. The information is provided to the general public and is not intended to be directed at any specific legal issue. TVoP/FESIG contains Internet links to other resources and businesses. Those links are provided to help you identify other Internet resources that may be of interest to you but are not intended to state or imply that FESIG endorses, is affiliated with or related to, verifies the accuracy or completeness of the content of, or sponsors these other websites. FESIG in no way represents that these other websites contain accurate, complete or useful information. Donations are the life-blood of charities. Without funding from kind, giving members or even strangers, these not-for-profit organizations would not be able to carry out their missions. Any donation, be it monetary or in-kind will be accepted and appreciated. How this Work is Done: This initiative was founded and funded by Crystal Goh, and is managed by her, the only administrator of the website, youtube channel, and facebook. This takes all her time and dedication, as well as to answer everyone's questions and comments. There is only so much one can do for so long...if you want to see FESIG grow to become more visible and impactful, please assist with volunteering or pay forward your extras to enable us to afford staff to making improvements on the website, youtube channel, and Facebook. Submit your name and email address to get direct notifications for meetings/events along with reports and latest news (only once a month). Don't just be an ordinary member, be an EXTRAORDINARY ONE, if you feel it in your heart you have a purpose for your existence here and is a solution thinker, doer, giver, join us in The Foundation! Become a Finder! The Finders are exceptional and extraordinary individuals to form this special breakaway community called The Foundation, Apply within. As of November 2017 onward, FESIG meets publicly once a month on the 1st Wednesday in 2 sessions - 1 or 2 speakers with 40 mins per presentation followed by 15mins Q&A per session with both FESIG regulars as well as new members alike to convene the meeting. Attention! Jared Rand, of Jared Rand's Global Guided Meditation Call; speaks at FESIG's 64th Meeting about the RV, Funding, Free Energy, Replicators and disclosure intel and the Celestial Chamber for Healing and Rejuvenation. Dr. Elizabeth Donavan co-chairs with Crystal Goh. Jared Rand wrote of his bio: "I grew up in a military family the youngest of 5 children. We traveled the world every 2 years we would pack up and move. We were like gypsies. It made you grow up quickly but I would not have had it any other way. I am here at this time with this planet to assist the civilization to break away from it's enslavement and to free it's consciousness to think for itself and lead itself. To exist in complete harmony to be humble and in complete gratitude. To love ourselves and each other and to VALUE LIFE as the highest value in the UNIVERSE. To create value and build wealth. To expand into the universe and beyond. I am here in complete humbleness and DEEP ETERNAL LOVE to serve you all." He brings uplifting and enlightening messages in his guided daily meditation to thousands globally, and has alot to share with the world on disclosure intelligence information. He is one of the great master teachers, spewing pearls of wisdom, inspiring many to be empowered and to go within to be connected with the true self! Just prepare your impertinent questions, join us in the meeting and he's here to answer them for you. live. Thomas Buie of America and Gerard Morin of Canada of Canada both worked on developing a self-powered system which provides kilowatts of excess power to power other equipment. Thomas feels strongly that water and electricity are part of a person’s rights and not a privilege which has to be paid for. They developed this selfpowered generator in order to supply the electric needs of a household. Pontus Hassbjer, Patrick Kelly & Thomas Buie talk about the Morin-Buie Motor Generator Prototype that's near completion now with FESIG Team on planning the Training Course of the device. "The Practical Guide to Free Energy Devices" The author, Patrick J. Kelly is one of the pillars of the study of exotic free energy internationally. Click here to access The Practical Guide to Free Energy Devices. He has painstakingly researched to develop and archived a compendium of free energy information with coverage of historic and contemporary devices for our study reference. Free Energy Reference Information. Patrick's websites are http://www.free-energy-info.tuks.nl & http://www.free-energy-info.co.uk. It is highly recommended by Elizabeth Donavan (Kevin Hay looks it up like his bible!) for FESIG members and visitors to browse these sites, downloading the book or at least skimming through it! It has 3,300 pages and growing as he updates regularly with his own personal comments on viability. This has become the reference manual for free energy enthusiasts! Early in Jan 2018, Martin Burger talked to us about his tidal powered energy project that would be the basis of his his new crypto currency ICO and are looking for exceptional and extraordinary individuals to form a special breakaway community called The Foundation, a solution service, consciousness domain that will be declared a sovereign nation governed by a Holacratic Constitution. He said successful applications will stand to receive a royalty stream of a gift, a precious metal backed cryptocurrency which will be airdropped to them, who will be known as “ The Finder” Apply within. Recent announcement to note: To those who have applied within, thus far, as time has now passed on this promised blessings, inadvertently, although as in any mega project such as this, it is heavily reliant on the Chairman's leadership with his team and we are awaiting his call to participate when he's ready. Click here for the transcript of the Chairman of The Foundation, Mr. Martin Burger's speech during the 48th FESIG Meeting on the 3rd Jan 2018. A report on a mistaken copyright strike on FESIG's youtube channel that had renderred our inability to produce the monthly videos for 1 and a half months from 14th May - 30th June 2018. Click here to read about it. Here in FESIG, we strive to have as good a Meeting as possible as recordings are unedited for youtube public viewing. As such, we appreciate some newbies might not be familiar with business meeting etiquette that are expected of them during the 2hr session, so it is recommended that this standard guidelines will help in achieving a good productive meeting for all. A new design for FESIG's logo has been launched on the 18th April 2017, replacing the old logo. This is followed by new FESIG Youtube Banner Design (28th April 2017) and Facebook Banner design (18th April 2017). Tom Van Keulen contributed a creative video clip production presented to FESIG as its Brand Ident Intro clip for FESIG's youtube videos. Thank you Tom! Voice-over, copywriting contents and all graphics compiled and designed by Crystal. The 63rd FESIG Meeting’s 2nd session on the 2nd April 2019, started off promptly with Crystal Goh continuing that the FESIG Team is working on the 1st Free Energy Device Training Program. Pontus Hassbjer took over the explanation of how he is coming along with the making of the prototype of the Buie-Morin Motor Generator device. He went through the paces…showing the parts required. Pontus showed how he could take apart an old engine to recycle into the functional parts for casing and structure to hold the device. Then he explained why he had to do some machining to tailor-fit the parts into the casing. He even shot video clips of the machining works. There had been some questions, discussions, suggestions and knowledge inputs from the meeting attendees who are experts in their science, such as Ayvind, Sergy, Paul, Bo, Jan and Vince. Fraz was on hand to assist with the co-chairing whilst Pontus continued to go into details of how he used the materials, the types of metal used and the machining in precision engineering. He shared the videos he did, preparing, drilling, machining the parts to fit the whole. Fraz said that certain parts of the old washing machine doesn’t work so we have to modify it, have to machine to reconfigure the parts ourselves. Fraz pointed out that the cost isn’t that much, reminding people that there are workshop venues in communities that can be shared and used with a small membership fee to go in to do the machining of the parts to tailor fit. Pontus then say that anyone can learn how to do this. It isn’t difficult by learning and replicating what he is doing. In fact a few people are already starting to follow to build it…He systematically showed how he then fitted them together. He even has a belt driven balancing system machine to balance the 2 plates so as to fit the rotor and shafts precisely. Balancing is crucial as Fraz explained that the fitting is very tight, any imbalance in the system, in the rotor or shaft will cause a vibration, making a difference in the electrical current of the magnetic fields in there. If it’s not balanced in that high RPM, the machine tears itself apart! Pontus showed one part after another that fits beautifully together! We can manufacture the precisely machined parts for others to put together in the future. Pontus called out for people to check out Patrick Kelly’s (author of "The Practical Guide to Free Energy Devices") presentation of the Buie-Morin Motor Generator in his eBook, on how it works. Patrick Kelly commented on the speed of the motor and is concerned about the precision alignment that only a skilled operator such as Pontus can achieve. Patrick then said that he’s relying on Pontus’ completing the prototype so that he can then modify, refine the instruction manual precisely for all concerned. The meeting was then adjourned to the 1st of May 2019 where Jared Rand will continue to speak and Pontus will hopefully by then able to show the completed prototype! So join us again! The 63rd FESIG Meeting started off with Crystal Goh, the Chair, welcoming the 100 meeting attendees. The speaker Jared Rand of the Global Guided Meditation Call spoke of his Celestial Chamber. 9 feet long in structure. Powered by plasma and tachyon particle field. Controlled AI and database of the human body - frequency field energy range of the body. Melatonin infused- so the person goes into a deep sleep. Body carries DNA memory. The energy field is still there in the DNA. The halo flows over the body, completely analyse the human form, identify all the anomalies in the human form. There's no pain nor cutting or anything - the body is completely unviolated - Process takes 3 mins. Organs, limbs are regenerated. Implants are atomised or eliminated. It will also reverse the ageing process, mostly controlled to the age of 35, but could go down to a very young age. This is not an Earth technology. A quantum entanglement design. Everything starts with the mind , ‘cos our intention has set it forth, according to our ultimate goal is for homeostasis for all subjects of the world, to have a total balance over any stress that could be visiting them. The Celestial Chamber - bio organic material of the chamber encases the patient that conforms to the shape and size of the body. It picks up the DNA genetic blueprint…The CC is to eliminate the stress, anxiety and fear that this civilization is being literary saturated with, to free it, to think for itself and to lead itself to progress on a measured basis. The DNA memory of imperfections is to be erased as the body would not have anymore resonance to these anomalies, genetic defects from family members are removed it’ll be in a more pristine position than ever was in the 1st round! In the immune system in the body a harmonic field is generated to protect the degradation of the body tissue. The protection is supercharged after the treatment and nothing will affect it anymore. Re-aging is instant! If you understand the electric Plasma frequencies in the hyper quantum field of physics, like a voice analyzer, it goes up and down, up and down, the CC re-atomize that frequency to an absolute a smooth line frequency so the body in disharmony begins to deteriorate rot. It was genetically modified to be that way but if you genetically demodified the human body, so that it’ll accelerate at whim, at will, its ageing and it’s de-aging. It’s as if a time field frequency is placed in the body so that it accelerates and reverses as if the wrinkles and the anomalies were never there! Life extension. A prototype is in production right now. Body must be in a state of stasis (deep sleep) in order for it to be harmonized thru’ the CC with the Plasma and Tachyon control particulate. This is a 39th Universe/Dimension galactic technology. Take an 85 yr old man and re-atomized into a 35 yr old young strapping guy with all imperfections taken away from him – younger than his kids, emotional ramifications here! Will cause riots. A lot to think about to make sure that every human will have access to this device. Eventually, every household will have one A self-powered micro cube wirelessly through Light communication powers the device! Free Energy. There ere great questions asked in the chat room where James Rink had fired in rapid succession to Jared. Listen and watch all for details. Then this meeting was adjourned to the 2nd session where Pontus Hassbjer will share the making of the Buie-Morin motor generator towards beta testing and training preparations. The 62nd FESIG Meeting’s 2nd session on the 6th March 2019, started off promptly with Crystal Goh announcing that the FESIG Team is working on the 1st Free Energy Device Training Program. She then introduced Patrick Kelly, author of "The Practical Guide to Free Energy Devices" who started to present the Buie-Morin Motor Generator, and how it works. (Please go to Patrick Kelly's Chapter 32 of his website http://www.free-energy-info.co.uk/ to read about it) Thomas Buie of America and Gerard Morin of Canada both worked on developing a self-powered system which provides kilowatts of excess power to power other equipment. Thomas feels strongly that water and electricity are part of a person’s rights and not a privilege which has to be paid for. They developed this selfpowered generator in order to supply the electric needs of a household. Patrick then went on to explain the different energy KW consumption of the different household appliances and mod cons. The self-powered electricity generator provides you with free electricity is essentially this: A battery is used to power a standard DC-to-AC inverter. Then the voltage is stepped up to around 400 volts. Next, a special controller is used to feed that 400 volts to a powerful motor at high frequency, and finally, the motor is used to spin an AC generator called an “alternator” which produces the electricity which we want. Part of that electricity is fed back to the battery and inverter input in order to make the system self-powered. The main components of this system are the controller and the motor. He then went on to explain the Arduino board circuitry and the Arduino / Motor interface. Patrick is such a great teacher! An amazingly hard working man, so passionately dedicated to his work! The chair then adjourned this 62nd FESIG Meeting to the 63rd which will convene on the 2nd of April 2019, which is a Tuesday. FESIG 62nd Meeting with Antonia Lau on Starseeds, Antartica, Earth Changes, free energy. Antonia Lau has been known for years as, The Psychic's Psychic; the psychic other psychics go to for their readings. Psychic, Clairvoyant and Clairaudient, since very early childhood, Antonia has been an avid and meticulous Metaphysical Researcher and Practitioner for over 45 years. With the Gift of being able to see and hear the person's Guide/Guardian Angel, she has done 50,000+ Readings Worldwide, to help vastly improve the quality of their Spiritual Growth and Awareness. Antonia Lau talked about starseeds and information given to her about divine missions. No competition between us, a lot to be done. Earth has changed its poles’ position. Volcanic eruptions. 20-25 per year 1100 active volcanoes. Earth changes. Showed shift. Government’s mandate to reduce the population. Don’t want you to know about the changes till they are ready to pull the plug. All the clean energy, free energy, needs to be released. There’s a lot of work to do. People must go within. Meditate everyday! Be self-guided to go to safe locations and rebuild. Antartica has 600 million acres of rainforest to be uncovered after all the ice melting is done. Q&A session started with Elizabeth asking about the Noah Factor. HAARP is used to control climate, global warming, melting of the ice to access the secrets in Antartica. This was then adjourned to the 2nd session of the 62nd FESIG Meeting where FESIG's Team plans the 1st Free Energy Device Training Program with Patrick Kelly doing the honors of introducing the Free Energy Device and its teaching modules. The 2nd session of the 61st FESIG Meeting kicks off with a brief Q&A with Fernando Vossa followed by an important announcement of FESIG having the opportunity at last to launch its 1st Free Energy Device training program with a Forum session (FESIG EXCO members and regulars). Introducing FESIG's 1st FE Workshop, and its Steering Committee. The alternative energy 'Gerard Morin Motor Generator' inventor, Thomas Buie, speaks about his device, a sneak preview on the workshop he is open-sourcing via FESIG. On the Q&A session with Fernando, Fraz asked about the material he’s using for the Vossahedron. He talked about using the Cactus and Aloe-vera goey substance as the most incredible biopolymer substance he’d ever had. Then Thomas Buie was introduced by co-chair Pontus Hassbjer. Thomas said he received this info the 7th time he died…God taught him how to do this! He spent the last 10 yrs researching and building and working with Gerard Morin who’s in China right now. 3 facilities, one in Canada, China and another in Australia. In a rat race of a competition to see who can come up with a working model 1st! He explained the Arduino and circuits and how it works! He shows how it works. Gaining voltage….collapsing fields… He showed his production facility with all the equipment used to make the device. Crystal introduced FESIG's Steering Committee, preparing the Training Program. Thomas showed his work bench and materials, humbly apologising for the clutter and lack of sophistication due to lack. There's a call for paying forward for our research and work to bring free energy to you. The crux of our work needs contributions to bring it out! We're out there hunting with the wolves, Fernando said, we need support for independent research! The meeting was then adjourned to the 62nd FESIG Meeting on the 6th March 2019 when Thomas Buie will speak about his Motor Generator with another speaker yet TBA. 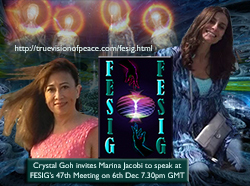 The 61st FESIG Meeting commenced promptly with the Chair, Crystal Goh introducing Fernando Vossa, BioFuturist TerraHealer Artivist, Planetary Scientist Light Body Technologies Cosmic Love & Wisdom. Fernando Vossa said, the idea is how to unite the sciences but in the spiritual quantum sense. The brand Vossahedran - a new class of geometry from the Flower of Life. It's like we are looking to return to Source, to return to the moment in the womb where we were part of as the cycle of life….we've always been missing this home. A free energy device to act and behave like the law of the womb. My job is to bring back the unification of the womb. electric fire and liquid light. which pertains to rejuvenation. I’m living in Baja California which allows me to study the structure of the cactus. Which has its own electric field and communication system. How do I relate this to my work in creating a healing home. It's too late for sustainability we want to bypass sustainability. Installation through art not through science…. the mission is about healing everything and then into regeneration. HAIA - Healing Installation As A Home - working with a natural element of water, electricity, magnetism, light and sound, food that heals our bodies not just dirty electricity bio architecture - building the shapes of life itself in architecture. Invented a concept called the Centre of Mass Creation - took the best of healing and free energy and put them together. this project has 12 Laboratories, 12 areas of focus energy healing the Cosmic awareness, Light, water, crystal sound and structure. True innovation occurs when you are healing with light. Terraform the Earth first before we terraform any other planets. Activate your super-powers in your DNA. Hold your intention in what you are here to do. Harmonise the intention with the intention of others. All of the advanced systems with artificial intelligence are weaponized. We can’t do this anymore. My work is about vibration and frequency - it's about looking at different cymatic patterns like the star Flower of Life design. You can see how weaponized our electricity is. I started looking at thousands and thousands of principles from one plant - the San Pedro cactus. I was looking at the fractality, this forensic photography. How is the picture breaking up. Electricity, sound and light have a spirituality, seeking their God. If we don’t get off our artificial transhumanism agenda, we will never understand this. Crop circles are free energy technology antenna that is natural intelligence analogue. Natural intelligence is infinite. Analogue devices are infinite bandwidth. 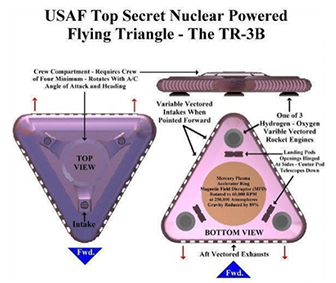 The Vossahedron is actually a 3-Phase Earth Battery Tesla Technology. It is a chronometer that follows the Sun in perfect proportions in increments of 12. It is a ship, a magnetic levitation structure. A Clam shell design that has a top and a bottom, blocking out matrix radiation systems, designed as a stealth structure to the Matrix and a living structure to the Earth! An acupressure point in the Earth, a living being like a cactus. We are ready for a new geometry for our architecture. Vossa's amazing Sonic Reiki healing was shared on his videos. Co-Chair, Fraz Frazzle asked a few technical questions and moderated the Q&A from the floor. Then this 1st Session was adjourned to the 2nd session for more Q&A and the FESIG Workshop Committee presenting FESIG's 1st Free Energy Training course in the making! The 2nd session of the 60th FESIG Meeting Forum (FESIG EXCO members and regulars) Q&A with Kerry Cassidy commenced promptly with the Chair, Crystal starting the ball rolling with the 1st questions, i.e. if the SSP advanced technologies aren’t released soon to rectify, heal our ailing planet and the sickly native species on it, soon enough, it’ll be too late to save Mother GAIA and the Homo Sapien species that’s veering dangerously into extinction. Kerry said that there are certain ET groups, such as the Guardian Races, that contributed their DNA to making this vehicle inhabitable by in a sense our essence. It is an experiment. That every planet gets terraformed and then made available for various species to have this 3D going onto 4th D experience is created and then looked after. She believes that the interlocking system that we are dealing with in Planet earth and the solar system In essence we’re not going to take so much trouble to make this happen and then to allow it to go into extinction. This is the 3rd or 4th seeding on this planet. There’s help to make it thru’ and continue to going out to the solar system, creating our own world and then to help the other civilizations in the solar system; so there’ll be safeguards put into place. The negative serves to result into the positive. True that this is very dense and negative and also a take-over happened, but this seeding is not ascension ready. Returning to the fall of Atlantis beyond this point. There’re steps to continue to safe guard this experiment. Crystal then asked why Kerry isn’t positive about the advance healing tech (e.g. Capt. Randy’s Holographic Med Beds) and the free energy tech (Daniel Cooper’s) of the SSP being released to the grass roots, she said the whistle blowers that she deals with are working for their superiors who does not like that to happen so they may not know or just acting on the filter of information. Kerry believes that the big airlines corporations are using form of free energy to get their jets to fly behind the scenes, possibly even in the electrical grid, these big corporations are benefitting financially by doing this but NOT for the benefit of all. Keeping their operations going as the Illuminati control grid running the planet! Free energy is not free…even various ETs are also after the power. Neutron Star Energy is even more sophisticated than free energy. More than one SSP, as China, India, UK, US, NZ, Australia, Canada, all working on their own SSP projects. Mixed bag. We certainly aren’t going to have their free energy or healing techs released nor are we going to have a New Age anytime soon. There’s an attachment to the material world – SSP focused on that as they and the NOW is intent upon suppressing the bulk of humanity’s consciousness to stay on a certain level so they do not get connected into a unified field to raise the vibration of all of humanity and the entire earth at once to ascend en masse which will be a different story. Co-chair James Rink then asked some questions about Mark Richards, and his wife Jo Ann Richards, Kerry’s SSP whistleblowers. About the China moon probe – Kerry said to watch her 3hr interview with the late William Tompkins…about the Reptilians and the Greys occupying the Moon and China going to the dark side of the Moon. Capt Randy Cramer hopped in last minute. Thomas Buie talked about the free energy that he can come up with. Crystal wants him to do a work shop for FESIG. Kerry Lynn Cassidy, one of the leaders of the disclosure movement, CEO and Founder of Project Camelot projectcamelot.tv aka projectcamelotportal.com (todate >60 million unique viewers worldwide and over 218,000 subscribers) who apoke at the 37th FESIG Meeting on June 23rd 2017, spoke again at this 60th Meeting with latest intel info! The 60th FESIG Meeting commenced after the Chair Crystal introduced everyone present. Kerry Cassidy, CEO/ Founder of Project Camelot, spoke about the secret space program being concerned with healing humanity except perhaps as a subset of the drive to explore and dominate space. They are interested in using technology to lengthen life span and enhance the body through nano, bioregenesis and cybernetics. They are also concerned with building better super soldiers, androids and reverse aging. Portals, time travel, parallel earth, etc…Tesla has an ET heritage, he has been receiving information downloads contributing to his work. The Earth is a Being and has kundalini energy and so have we. All part of Source. The Light Body can bi-locate to another location and can bring about ascension….and has no limitation. Ralph Ring and Otis Carr’s work on free energy with the use of orgone and chakras. Technology is a short cut which isn’t natural. Take over of the essense of a crystalline base silicone organism. Anybody who wants to do space travel will develop AI, a silicone based life form. Super soldiers are linked to Nano….which links to AI which has an ability to control us. Cannot underestimate the power of soul and Source which supercedes all of it! Our physicality are moving from 3rd D to 4th D and 5th D.
Marina Jacobi has a short dialogue with Kerry about the messages she’s bringing in from the Council of Nine. Then Smarty John Mendez too. The meeting was then adjourned to the 2nd session after a short break. Please look out for the 2nd session recording where FESIG EXCO members and regulars have a Q&A forum with Kerry. The chair, Crystal Goh and Co-Chair Fraz Frazzle started off the 1st session of FESIG’s 59th Meeting with Kevin Trimmel of the SSP on a later date than the 2nd session (8th Dec 2018) in order to catch Kevin at the right time, as he lives off-grid in the outbacks. Kevin started talking about the TR3Bs and the various propulsion systems. Spinning plasma type propulsion systems, that are built in the Mars Colony, and they are also the crystalline engines and the piezoelectric effect using crystals. The TR3s are flying about in our airspace at all times. Stealth and scout craft (the white crafts), acting like the coast guards of the planet. ET piracy to steal people with the abductions, patrolling the air space. Kevin said there’re a lot of different Secret Space Programs worldwide with a lot of treaties with each other, competing with each other as well. ET Allies SSP, the different countries having their own ET allies SSPs. Renegade ETs doing their bait and switch and ended up controlling the people thru’ their government officers who sold their souls to these regressive negative ETs in exchange for genetics, human trafficking and slavery. Renewable energies do exist but suppressed. Status quo is still oil, fossil fuel. Then Kevin talked about the White Light Trap, Reincarnation (a biological phenomena) and the dangers of Channeling. The White Light gets us trapped in the Photon Belt when we leave the body as in death, to go into reincarnation back here. The White Light Trap is an ET technology, a PPAI controlled technology using us as a recycled slave race. The Black Goo sentient fluid is being discussed. BUT our Ascension Cycle can’t be stopped and is on track, we’ll be vibrating at a higher frequency raising the megahertz level so the Black Goo couldn’t touch us …to transcend the White Trap. Sun Mu Kong is Homo Luminous, the Legend of the Monkey King linking to the AI was discussed. The meeting was then adjourned to the next meeting, the 60th FESIG Meeting on January the 9th 2019, when Kerry Lynn Cassidy of Project Camelot speaks. 5th Dec 2018, 59th FESIG Meeting FESIG’s off-the-cuff Conversation with Jessica Marrocco and Penny Bradley. James Rink co-chairs with Crystal. This is the 2nd session of the 59th FESIG Meeting but was held 1st ‘cos Kevin Trimmel, the speaker was not able to avail himself with an online device till the 9th Dec. James Rink introduced Jessica Arael Marrocco of www.readingsbyarael.com. Psychic Clairvoyant Jessica started off with the 3rd, 4th and now the 5th Reich, discussions with Peter Berger of the ACIO, the nos. group. Apparently Jessica is no. 12 at the ACIO (as A.R. Borden being no. 15). The 3rd Reich, the time travelling Nazis. The 4th Reich, associated with the hybrid group called the Tall Whites. The 5th Reich is another which as originally associated with the 3rd Reich, off world over-seeing things here – no longer associated with Alderberan. The 5th Reich is trying to introduce new agendas in this planet that has something to do with control systems…bringing about a Universal or One World Order. Penny said her experience was zero point energy. We pulled electricity directly out of the ether of space. Space is not a vacuum, it is ionized molecules floating in currents. You can pick up electricity right out of that. We shouldn’t have to pay for anything like that as it’s free. She describes more of the techs there. Victor Schauberger’s engines had been modified to operate… Then the portals and worm holes… Please view the rest of it for more disclosure information from Jessica and Penny, prompted by our members… Ron's question about Capt. Randy Cramer’s ranking is being set right. He’s O3 in the navy which is like a captain of a ship, equivalent to a Colonel in the air force. He came in to join the conversation from the 1hr 20mins on setting us right on the relationship of the world’s most secret clandestine activities, the SSP, the ICC, NSA, ACIO, the ET Galactic communities and their connections. Randy talked about the strategies and timing schedules of the process of bringing out the functional prototype of the Holographic Cellular Regeneration Med Beds. Funding is crucial. Randy said if people (especially the CEO personality type profile who are all out for themselves and their corporations only) and things don’t change (from their greedy and selfish ways), and not allow disclosure and the release of these technologies that are critical for the survival of the human race, our species are going to die off! It has been a very interesting forum. Please view the rest of it… The meeting was then adjourned to the next meeting, the 60th FESIG Meeting on Jan 9th 2018. The 58th FESIG Meeting had taken place on the 5th Sept 2018, where our Speaker, Capt Randy Cramer talked about his amazing game changer mission. Captain Randy Cramer, having spent a 20 year tour of duty with the EDF, his experience and knowledge is vast. His observations on tactical analysis of this subject are based on more than 2 decades of objective and rational experiences to apply as a consultant on all affairs exoplotique and a vast array of socio-technological interactions that can be applied to current gaps between the here and now and living in a world of the future. As one of the most knowledgeable USMC s.s. officer, he will be disclosing some of the most advanced technologies! He will speak about the FUTURISTIC H.R. MED BEDS as it is his mission to bring the Elysium type of technology for healing humanity. Quoting him, "We should all share in the benefits of the progress of the true mastery we have over the laws of physics, energy generation, propulsion and telecommunications from the SSP. We should all have a future we can look forward to, and not just a pretty one for some, but for all the people of this living and conscious planet." Perhaps Randy holds part of the key to some answers to Crystal's continuous asking for a way of bringing together a group of the researchers, scientists and developers of the very advanced SSP technologies to replicate them that humanity needed so much to heal and sustain! The 56th FESIG Meeting on the 5th Sept 2018, our returning speaker Penny Bradley (spoke during the 23rd FESIG Meeting on 16th Nov 2016) and new co-speaker Joel Othideous Chase of the Secret Space Program talked on off-planet technologies in this forum. James Rink (founder of SuperSoldierTalk.com) co-chairs and joins in the conversation at FESIG's 57th Meeting! Crystal went through the ramifications of the motions of the 57th FESIG Meeting, introducing the speakers, Penny Bradley’s background as a pilot transporter for Dark Fleet at the SSP and Joel Orthideous Chase aka General Hendricks, his Alter in service currently with the Secret Space Program. He says, "I am from the world Ykarta. I am a 6th dimensional starseed. I am Joel Lakey on earth I have lived millions of life times . Mostly on reptilian home worlds. I am 40% reptillain and 60% human." Penny started talking but Crystal interrupted by asking James Rink, co-chair, to explain to the layperson viewers about the Secret Space Program and the 2 main factions, the Solar Warden and the Dark Fleet (Nacht Waffen), putting it in a nutshell so people could relate to where and how all this is about. Penny explained about how she worked there, with the different factions, and how the Nacht Waffen thought they are the good guys, the secrecy, and where the CIA got their power from during the Eisenhower administration. She talked about the CIA’s cruel exploits. 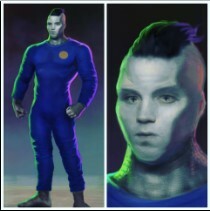 Joel, who worked directly with the Dracos, said he served directly under a White Reptilian Commander. Crystal asked about the space crafts they travelled in and if he could talked about the technology. Joel said that he’s very frustrated with the very primitive slave technology on planet now as it’s very controlled. Watch it all for the disclosure information. The 56th FESIG Meeting on the 5th Sept 2018, started promptly with about 12 in attendance. Crystal Goh the Chair, introduced Don, an internationally known neuroscientist, author, lecturer and inventor for a journey beyond the quantum, on the other side, in the spectral domain in which all realities originate. Don Estes, considered to be one of the world’s most knowledgeable experts in vibrational and esoteric science, serves as CEO and Director of Innersense Inc, Psiometric Science Inc, certified medical technologist , laboratory director and neuroscientist, lectured worldwide on sound, sensory science and vibrational medicine, appearing on CNN, NBC, ABC, Entertainment tonight, science frontiers, the Discovery channel, won an Emmy award in 1984, his work has been featured in Wired, Computer Design, Los Angeles Magazine and national and international media as his book, Harmonic Law, the Science of Vibration, entitled the The Absolute Scale of Cosmic Reality, is one of the most complete compendiums of scientific and philosophical knowledge assembled. He founded InnerSense/Psiometrics, Inc., and inventor of VibraSound® and other transformational, award winning technologies. His most recent technology called the Portacle, is now available online at http://www.theportacle.com. His invention of VibraSound Sensory Resonance, are technologies used by both professionals and non-professionals for music, sound therapy relaxation, entertainment and expanded states of mind. This includes proprietary knowledge on patterns on the view of Light, Color, Sound, Music, algorythmic alternator. In addition to being a consultant to the rejuvenation retreats, day spas, mind spas, medical professionals and entertainment facilities worldwide, as he has designed, built and operated 3 award winning facilities: Inner Space, Mind Wave and The AHA Spa. The 55th FESIG Meeting commenced with Crystal doing a guided meditation of a distance healing for Don Estes who was suddenly hospitalised for a mishap and wasn't able to speak! The chair Crystal then introduced Dr. John V Milewski, Ph.D, P Eng of Superkinetic Inc., the scientist/inventor who holds 30 patents and has over 42 publications in his field and the Man who turns Glass to Gold! He is an Internationally recognised leader and consultant in his field of Advanced Materials. He is a professional engineer, scientist, inventor, entrepreneur, writer, publisher, editor and lecturer. He is a retired staff member of Los Alamos National Labs and has worked previously as a scientific staff member at Exxon Research Center and at Thiokol Chemical Rocket Engine Div. He holds 30 patents and has over 42 publications in his field. He authored ORMUS is a Gas, The Effects of Magnetic Water, Superlight: One Source, One Force, Assembly of the Tiny Trap, Whiskers and short fiber technology, Development of manufacturing capabilities for hafnium carbide fibers: Final report, and coedited The Crystal Sourcebook: From Science to Metaphysics and Handbook of Reinforcements for Plastics. His patents include Method and apparatus for continuous controlled production of single crystal whiskers, Single crystal whisker electric light filament, Method of producing silicon carbide articles, Method for producing solar cell-grade silicon from rice hulls, Rocket motor, Composite heat shield, Light metal alloys strengthened by oxide, carbide, or nitride fibers, Apparatus for impact testing, High strength fiber reinforced composite, and Method of growing single crystal ribbons. John along with his son Dr. Peter D. Milewski had their crystal filament light bulb invention Patented and put on permanent exhibit at the Smithsonian American History Museum, titled “Lighting a Revolution” honoring the six most significant ideas in lighting field from 1950 to 2000. The picture on the right is Martin Burger, the Chairman of The Foundation, making Milewski's Gold. Dr. John Milewski is Martin Burger's partner in the 'Turning Glass to Gold', a Blue Energy venture. Martin chipped in with the description of their gold making venture together and also reminded all about the huge project of creating the Foundation that will be the basis of our breakaway sovereign nation. James rink, the co-chair opened up the floor to Q&A, After everyone in attendance had their say, the meeting was adjourned to the 56th FESIG Meeting on the 5th of September. John "Smarty" Mendez spoke as 1st Speaker at FESIG's 54th Meeting sharing his Holotech energy technology frequencies that manipulate matter for the betterment of mankind from Environmental toxins protection,EMF reduction, Emissions devices, Battery booster, Optimum health. John Mendez is CEO and Founder of Holotech. Smarty's dedication to helping others led him to becoming the founder of HOLOTECH and he is now making an impact in the world of Pure Soul Energy Science. He shared his website where people can download his wide range of EMF and orgone products for free. The second session of the 54th FESIG Meeting started with the chair, Crystal introducing the 2nd speaker, Michael, ADGEX Representative, who is an Innovator, technology promoter, Internet entrepreneur, member of IIUPA (International Interacademic Union of Public Associations). Michael presented Adgex, green energy, waste energy, energy storage, new technology approach in electronics, the ‘greenBLAZE’ waste to energy system, and the ‘energyBrick’ electricity storage system and VITIM : Vital Integral Technology of Intellectual Matrices. Michael has always been working at the edge between innovation, science and business. During the last 15 years he focused on technologies capable of changing the way how our civilisation generates, stores and uses energy. Along with this he runs an Internet company and is involved in medicine. Based in Germany he maintains excellent relations to the Russian world, the East and the West. ADGEX is currently the most ambitious project with the power to bring a big set of game changing technologies in such important areas as energy generation and storage, waste management, water, transportation and others. The 53rd FESIG Meeting commenced with Crystal introducing Neo Glimmer, whose mission is Seeding Ascension-Coded Commands to speed up the Event for Humanity's Ascension; and welcoming back Marina Jacobi, interpreting these messages into quantum physics language for our scientific group! Neo Glimmer, became an overnight internet sensation when he 1st came out to offer his findings after deciphering the codes he received. He had an Event experience on March 15 2018 and was shown the comands. Then he made a 1st video about it describing the beings and what they spoke about! He was contacted by a higher dimensional being, who informed him of his mission, to decipher these Ascension Codes. The 1st video tells his amazing story. The 2nd video details the actual Ascension Codes and their meanings. Here he explains the Event Codes. The Quantum Ideas writer wrote about Neo thus: Codes (by Neo Glimmer) that contain geomatria (similar to numeronics) in order to speed up The Event. When a large number of ppl see the commands (or the videos that contain the commands), there is a multi-consciousness that creates a wormhole into the higher dimensions. These codes were communicated to Neo’s Higher Self –or Higher Selve(S), as he stated –and meant to be “seeded” throughout the internet and viewed by lots of people in order to plant special energies to speed up the event. It involves reverse engineering from the Declaration of Independence and perhaps other documents that ended up enslaving humanity, (and these original documents created the illusion of freedom, power and independence). And so the negative “spell” from hidden meanings with the original Declaration of Independence is cancelled out with the codes. So when we copy it to the internet, we are effectively “seeding” or spreading it so the energies can anchor in across the web, spreading a powerful light in all directions. Neo explains each code and how it came to be. Marina Jacobi did 2 videos with Neo in mid and late April: Marina speaks with Neo video. Marina said she would do some interpretation of Neo's explanation of the codes as a quantum physicist would to our community. Listen on for details. The 53rd meeting was then adjourned to the 54th on the 11th July as the 1st Wednesday of the month, 4th of July is a public Holiday in the US. The second half of the 52nd FESIG Meeting commenced with Crystal intoroducing Michael Shrimpton, a London barrister since 1983, is a specialist in National Security and Constitutional Law, Strategic Intelligence and Counter-terrorism. Formerly an Adjunct Professor of Intelligence Studies in the Department of National Security, Intelligence and Space Studies at the American Military University, teaching intelligence subjects at Masters level to inter alia serving intelligence officers. He has represented US and Israeli intelligence officers in law and briefed in staffers on the Senate Select Committee on Intelligence and the Joint Congressional Inquiry into 9-11. Michael has earned respect in the intelligence community for his analysis of previously unacknowledged post-WWII covert operations against the West by the German DVD (or Deutsche Verteidigungs Dienst, a super-secret German Nazi Continuum Agency, a Nazi "holdover" from World War II with "franchises" around the world) organization based in Dachau, near Munich, Germany, and its British, French and American client agencies. His work on strategic intelligence took him to the Pentagon and met senior advisors to the President of the Russian Federation, in Moscow. Michael's ground-breaking, 700 page intelligence text "Spyhunter: The Secret History of German Intelligence" 2014, included the brutal 2003 assassination of British weapons scientist Dr David Kelly CMG. Shrimpton claims he was "railroaded" because he had exposed the DVD; the Nazi terror group he says run Germany but also runs the United States through the Bush family. As Michael’s distinguished Veterans Today colleagues Gordon Duff and Ben Fulford have confirmed, his intelligence briefing to MOD was substantially correct and two warheads, both off an SS-19, were recovered by the US. After inspection the Department of Energy estimated their yield at 20KT. Michael spoke about all the intriguing spy hunter material, which could've been borrowed and woven into plots in James Bond's films! Watch the video recording to get the details! Crystal invited Martin and Marco to update us in this 52nd FESIG meeting. The 52nd FESIG Meeting commenced with the Chair, Crystal, bringing back the Chairman of The Foundation (a FESIG new Initiative), Martin Burger, CEO – Founder of Blue Eagle Inc., Octan Resources Inc.& Blue Energy Canada Inc., to update us on his Cryptocurrency works. Martin's vision includes acknowledgement of equity for more than half a million of scientists and creatives supporting inventions, progress and solutions. He believes they’re valuable as members inclusively in this consciousness domain that will form around this community called the Foundation. He is currently preparing the ICO of his Energy Innovation Coin. His Gift: Targetted the airdrop to TVoP/FESIG. Join FESIG now! Whilst also planning to issue more coins to a select list of people who has had 10 years or a lifetime of service in this sort of solutions. As in anything mega, there'd been teething problems and bottle necks in the ICO preparations exercise. Fortunately we have in our midst, the world's 1st crypto inventor, brilliant 'Marco' (who asked to remain anonymous), a FESIG member who is in the ranks of Satoshi of Bitcoins, whom Crystal quickly put through to assist Martin to iron out those stumbling blocks in mid Jan '18. They had been working together succesfully making progress since then! Then once the ICO is successfully launched, Martin is going to start gifting $250 million dollars worth of Energy Innovation Coins!! His goodwill gesture – an invitation to join a very special community, a community of like-minded people just like all of you here. Join The Foundation as The Finder now! The coin will also be backed with a $45 million US dollar treasury note and then the equity of all of these innovations. Martin will then start with presenting four technologies initially, 3 of them energy related, one of them is a very exciting solution in nuclear waste scenario. The Bo Hai Tidal Project: The Bo Hai Tidal Bridge Project, generating in access of 70,000 MW of clean reliable power of the coming and going of each tide in sustainable energy! Marco explained the science behind the cryptocurrency and answered the questions from the floor regarding the technology. Then having gone round the table the meeting adjourned to the next speaker, Michael Shrimpton. The 51st FESIG Meeting on the 4th April 2018 started off with the 1st speaker Wayne Wangler presenting 'Miracle'. Wayne's journey into Plasma began from Mr.MT Keshe's "Blue Print" teachings with experiments in the rough. Wayne learnt that a small prototype would be practical to figure out how to handle 5-foot long coils, to see if there was actually a field that supported investing himself in further development. Prototype Mini was born as a result of this. There is no external power source, no batteries, just a self-generating and replenishing source of energy. He realised that large fields of energy can be created but without the coherence it does not bring the body back into balance. He decided to take a BIG jump into the unknown, making 19-foot long coils with one thousand feet of wire in them. Learning how to make, handle and Nano coat them took some time. Thus MIRACLE was born. Wayne talked about how he understood the shift in consciousness pertaining to acceptance of the truth, that we need to rewrite our understanding of how things are constructed and the greatness of what we could be. Plasma was a new term to him as an energy source to the Planet when chanced upon Keshe’s work. The potential is so vast! High frequency domain….as for Plasma we are unable to measure the energy yet as it had not being assigned to any purpose. Its potential are just possibilities. We are Plasmatic in nature. Our skin absorbs the plasmatic energy to regrow deteriorated/damaged cells. He showed an amazing testimony of a plasma device he called the Blue Tube. A stage4 cancer sufferer was experimented upon and within a week her distorted fingers due to severe rheumatoid arthritis dramatically improved without the pain and could become useful again as it automatically corrected itself. Then he talked about the miraculous healing within 2days, 20mins at a time… .massive repairs were accomplished! The coherence field that came out of it was so apparently powerful… sensitive people could feel its energetic field from some 200 feet away! Safe, calm and peace, Miracle has brought to Wayne. One other testimony is, a severe depressive 54 yr old suicidal lady, vomiting, and not eating, not sleeping, hearing voices in her head – imbalance in the endocrine system, no clarity nor focus, within 2 visits and on the 3rd one, all those conditions started to normalize, after a couple of months she had returned to her normal human being self. Been over a year now and testimonies goes on growing, prostate cancer, cancer of the brain, all in remission. One had her neck tumor shrunk 80%! Even our Whitney had severe pain which had gone after Miracle treatments! The list goes on… Miracle is acting as an amplifier – one can only go in there with a good and positive intention. Wayne wanted to keep it all very pure so he made Miracle all by himself with love and the highest thoughts. Even the space time factor in this field is rather distorted beneficially. Wayne had his telomeres tested and was shown he’s 18yrs younger than his biological age! Crystal brought us back into the old days of the making of margrav coils at the Keshe foundation and co-chair, Fraz reiterated on how he’d watched with admiration Wayne’s progress of the largest margrave ever into one of the most beneficial plasmatic devices to humanity. The meeting was well attended and the FESIG attendees were amazed at Miracle's amazing testimonies. After everybody had their say when the chair Crystal went 'round the table', the meeting was then adjourned to the next session with the 2nd speaker, Miles Johnston of Bases, UK. The second session of the 51st FESIG Meeting introduced Miles Johnston, investigative journalist, producer of the BASES PROJECT in the UK. Former Regional Investigations Coordinator for BUFORA, in Northern Ireland. He was at SKY television for 20 years where Miles co-produced and advised on a series of unique documentaries at SKY News on UFOs and was directly consulted for a major series by Transmedia, which aired a ground-breaking series, while doing his pirate radio work in Ireland, to start the Bases project interviews. Bases has evolved over 23 years to over 700 witness statement interviews and investigations from many contributors, now collaborating with Kerry Cassidy of Project Camelot amassing some 50 million views! Bases is also in the first major UFO documentary on British Television. Bases is a Researcher's resource. Miles started his 1st shoot in 1995 in VHS tape, interviewing whistleblowers since then. He talked about the 1st batch of publicly known super soldier, John Urwin who was trained on a post death procedure, who ‘died’ many times in his service with the British Military. He also talked about Michael Shrimpton’s work on Ancient German’s intelligence. Trans-humanized beings developed by the Germans during WW2 and a Sentient fluid being discovered. British intelligence had uncovered a lot of whacko information after WW2 from the Russians and Egyptians in the Middle East. Bottom line is, we’re talking about really advance technologies, interdimensional technology, anti-gravity, healing. People want these information to weaponized it! If you don’t modify the basic science of this, which is being employed by the SSP into the making of superhuman strength, enhanced and scalable structure super soldiers, for healing and preservation of the human species, then what’s the point? Burley Manor where the super soldiers were trained in England, with the many layers of decision makers in the controller’s panel, it was a rough ride for them. Then he talked about the biggest threat of the AI and others arriving here. The missing link in the making in the name of progress, is the spirit that’s most needed. He talked about Max Spiers, Barry King, Then he said the original development of the IVF (Invitro Fertization) was actually a by-product of the genetics and cloning program used by these secret organisations in England. It’s used to create and clone the super-soldier ET hybrids. AL499 between Welford & Peasemore was found to be one of the Bases in the UK. The Black Goo, the Falkland’s war and Antartica are linked. Vast quantity of black goo were found in containers at the Thule Island (recovering the Sentient Fluid…) found to be the German’s Uboat refilling depot. The British uncovered 400 crates of these interlocking containers using a submarine, 3 destroyers and ships to bring back to England to start their nefarious experiments creating Super Soldiers there in the bases. Elon Musk warned us about the AI…danger of annihilation of existential life forms here…. It is the Black Goo which is a cohesion of minute objects with a common purpose which slipped thru the energetic forcefield that protects us, mobilizing part of the Trojan technology dealing with our computer technology that has Artificial Intelligence and it’s accessing our consciousness - there’re companies with a plan to mass particle optimize humanity. Planet Earth is 3D prison…our consciousness is being used to create that! He then appealed to our FESIG group to develop something to beat this. Crystal summed it up, saying Game's Over, it's Ascension time for Humanity, nothing can stop us...prison walls are crumbling with all these exposures and disclosures. There was the usual Q&A, Crystal went 'round the table' before adjourning the meeting to the next on the 2nd May 2018. 1994 Recipient of the GUINNESS EFFORT AWARD. 1994 to 2000 Medal Winner at the International Inventions Competition of Geneva. 1998 Gold Medal Winner at the London International Invention Fair. 2000 Outstanding Young Malaysian Award. Watch his TEDx presentation. He presented his inventions, to begin with, his earliest one, the rubber stamps, then his blind man’s mobile phone. He showed how a blind man can use a touch phone to send text as fast as anybody else. He then showed his phone apps. How do they know which button to touch? His innovation is just a sticker with holes punched or embossed. He introduced the Blind man’s ‘Waze App’ on locating places. He stressed that innovations must be simple and cheap to be beneficial to most. He demonstrated how simple innovation can be with a good example like tying a rubber band as coaching to the young. Then he went on to present his wife, Teng Yu M-Mein’s award winning innovation. He talked about how the aborigines of the rainforest of Malaysia get unclean water to consume. His wife having noticed how this wasn’t good for them came up with great idea… watch the whole video to find out. The Chair, Crystal, introduced the speaker Andrew Theodore Murray, an inventor, researcher and activist on the regeneration of nature and alternative energy. Andrew presented with the Sustainable Living Road show, across the United States on advanced solutions to antiquated agriculture techniques, hydrocarbon consumption and transportation methodologies. He engineers plasma reactors which reduce harmful pollutants and the development of propellantless propulsions systems, space coherence accumulators, the non-weaponization of space. He collaborated with Unified Field Theory pioneers such as Dr. Elizabeth A. Rauscher, Dr. Stoyan Sarg, John Hutchinson, the late Guy Obolensky, Elizabeth Donovan and Nassim Haramein. Andrew contributes in Non-herzian wave mechanics EHD & MHD Material science, Bio-mimicry Water science Vacuum oscillations, Unified field Theories Astrophysics, Dusty plasma physics, Nuclear waste remediation Biological negative entropy Cymatics. Andrew serves to merge modern technology practices with culturally holistic and cosmos themed protocols to help generate self-sustaining prosperity for current and future generations. He discussed the recent investigation of various means of producing co-efficient performance metatropic system technologies, using different means, and the cold currents with Elizabeth, the Co-Chair, who said it’s called the quantum battery and talked about the insulators of Graphene and the Neodynium magnet. He talked about the plasma discharge… Listen on to their discussions. The 2nd Speaker, Anthony couldn't make it so we had to make do with just the one video this month. We had quite an interesting discussion of Plasma tech, cold current battery, electric and magnetic fields, then the meeting was then adjourned to the 50th FESIG Meeting on the 7th March 2018 at 9pm PST. The 48th FESIG Meeting, the 1st Meeting of the New Year 2018 kicked off with the Chairman of The Foundation (a FESIG new Initiative), Martin Burger, CEO – Founder of Blue Eagle Inc., Octan Resources Inc.& Blue Energy Canada Inc. He said Energy should be like air, you breathe it and it’s yours to use for free. When the block-chain cryptocurrency hit the $10K mark, it became the natural evolution, populated by the brightest, the most resourceful, creative and passionate people. The Vision : There are more than half a million of scientists and creatives supporting inventions, progress and solutions and they all have equity in this. So Martin, the Visionary’s thinking is, they have equity too and they should be acknowledged. And they’re valuable to have as members inclusively in this consciousness domain that will form around this community. The Gift: So he asked who would be airdropped? That when he came across TVoP/FESIG website and the wonderful work we do - he found it to embody the essence in targeting the airdrop. When we do the ICO, we’ll issue coins to a select list of people and will be very careful in selecting that list of people. We certainly will NOT deny anybody who has had 10 years or a lifetime of service in this sort of solutions as Martin thought they hold equity as much as he does. We’re going to start gifting $250 million dollars worth of Energy Innovation Coins!! He gets to play Santa Claus, to give all of this stuff out! His goodwill gesture – an invitation to join a very special community, a community of like-minded people just like all of you here. The Technology : Martin’s close associate John Milewski had redesigned the Tom Bearden’s motionless electric generator called MEG, the design and preliminary tests are very exciting. We're talking about a year or so away where we’ll be able to provide 5, 10, 20 KW with that hand held device of free energy! We’ll launch our energy innovation coin, we’ll raise $250 million, the coin will also be backed with a $45 million US dollar treasury note and then the equity of all of these innovations. We’re starting with presenting four technologies initially, 3 of them energy related, one of them is a very exciting solution in nuclear waste scenario. The Bo Hai Tidal Project: The Bo Hai Tidal Bridge Project, apart from bridging 2 important cities together, it will generate in access of 70,000 MW of clean reliable power of the coming and going of each tide, allowing China to become a world leader in sustainable energy! The Visionary: Martin is very confident it will be successful. He said, when he makes a choice, it’s done, Engineers make decisions, but Visionaries make choices! A choice has, in cosmology a divine aspect imprint. The Visionation Principles are quite simple but very powerful and unique in the sense that all the molecules in the universe acknowledge your choice from your divine aspect! Walking the Vision: And so the vision part is unique – the coin will take the Crypto ICO blockchain technology to a whole new level that’ll be much more greater indepth, with longevity and valuation. This will be a very valuable coin. The Alchemist: From engineer to alchemist, Martin expanded his variety of interest and skills. Ended up working with John Milewsky making gold out of brown beer bottles, using a microwave technique….so alchemy is now a game changer… please watch the rest of the video for more details! The 2nd Speaker of the FESIG 48th Meeting was Ileana, Star Traveler and ET contactee who visits various worlds learning about ET races and helping humanity on their evolutionary path in life. Ileana taps into the Super-consciousness universal field and TRANSMITS the soul records held at the Divine Source. The Star Traveler's website and Youtube Chanel: Awakening Cosmic Reality Show. Illeana started the talk on what happened to her since childhood. Auto immune system had been altered so she had to work on the energetic field to heal herself. ET contact on the Andromedan Council… Part of Disclosure is how do you create a world that’s clean, with free energy… we need sustainable solutions – looking out to the future generations and be good stewards to the Planet. This is where Martin Burger comes in to fund these safe communities with his new Cryptocurrencies… Heal thru’ food and plants ourselves. ETCs live for thousands of years as they live naturally like this. Holographic technologies had been around for 80 years in the secret space program! Illeanna showed pictures of the Holographic Medical Pods! Open bed MRI pods with Bio Mimetic gel that will prevent burns and scarring, The Portable Meditech heals and rejuvenate on location. Use only off planet and Underground bases. Laser Laporoscopic surgery can be done remotely anywhere in the world so we don’t need a doctor on site. 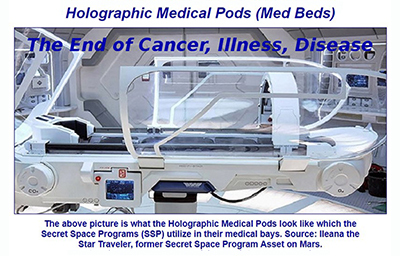 Illeanna was in the Secret Space Program with Interplanetary Corporate Conglomerate on the Mars Bases, so she saw how these medical pods were used on people to heal their SSP Assets. These techs can also be used for physical regression as well. They have replicators to even replicate precious metals as well. – been done in Mars and the Moon and off planet. She applaud what Martin is planning to free the blockade of the stuck alternative technologies with his crypto coin funding and so we can build these communities! She calls out to people to support FESIG in these endeavours. Crystal asked when the SSP will be shut down soon, where are these advance techs going to? Illenna said it’ll go to the healing centres, that also charged big money unfortunately. Scientists ought to get together to self replicate these technologies. Elizabeth Donavan said it’s possible to replicate it and even better without the SSP! And that’s why FESIG’s is here to bring this together. James Rink said a doctor from UCLA has a card that will heal . Radionics and scalar type techs also available. Pease watch the rest of it for more details. The 47th FESIG Meeting held on 6th Dec, with the 2nd speaker Kevin Hay, of Vancouver Island Ormus, after 1st Speaker, Marina Jacobi. This 47th FESIG Meeting was very well attended by almost 30 attendees in the zoom room with FESIG's regulars and some new members from Marina's and Kevin's followers. FESIG's key members Crystal, James, Fraz, Eliza, Iosif, Ron, Pontus and regulars Ulf, Trishia, Christian, and new members' presences helped make this meeting such a warm and highly charged one! Kevin, being a returning speaker for the 3rd time was graphically showing us the picture testimonial of his Vancouver Island Ormus healing benefits (on his scalp with a huge gash that healed within 12 days!) and hammering home his workable M.A.G.I.C. Mechanical Alternating Gyroscopic Inertial Compression device - which operates same way as a hydroelectric dam does even though it's just a simple and small device that people can make themselves. He explained with diagrams, the energetic function of Mass and Electricity - the biological functions - electromagnetic spin fields - electromagnetic compulsion function - micro molecular inertia - He said inductive cavitation induced through rotation is called Electrification. When Kevin finished his presentation, the Chair, Crystal made a panel session of discussions with Kevin, Marina and the key FESIG members and attendees, calling upon the scientists to recruit Marina's assistance to help them solve their equations. There was alot of excitement when Marina pulled out her drawings that correlate with Kevin's schematics of his blueprints - this being the 1st time they 'met' (spontaneous validation!) and they were both elated! The 46th FESIG Meeting was the 1st of the new format of FESIG Meetings. The 1st speaker, Tom Paladino researched and harnessed scalar energy, aka the Creative Strength, also known as prana, chi, radiant energy, zero point energy, qi, orgone, eloptic energy. He developed a technique using scalar energy that will transmute pathogens quickly and painlessly. He has developed a remote treatment process whereby he is able to administer the scalar energy reverse-phase angle harmonic of a pathogen, thereby causing that agent of infection to disassemble or fall apart. Scalar energy operates at the quantum level and is capable of disassembling all types of pathogens thus eliminating the causative agent of disease. Once the causative agent of a pathogen disease has been eliminated the symptoms associated with that infection decrease or disappear altogether. He said over the past 5 years he had perfected a technique that he can easily break apart a pathogen, a virus or a bacteria microbial fungus with scalar energy. It's easier to do that with Scalar Energy than with electricity 'cos scalar energy allows him to release the molecular bonds of a pathogen of an infectious agent. He said he can easily negate the bonds of the bacteria or fungi. In essence he claimed that he had discovered a simple painless of cause effective cure for viral fungal and bacterial infection. Scalar energy is not of the electromagnetic spectrum, it's a different dimension. The co-chair Fraz asked how the people feel after the treatment. He said that within a day or two people who were treated will feel better as their parasites and fungite would have been destroyed. The difference between pathogenic and probiotic bacteria was explained. Energy is fundamental. Tom calls for viewers to go to his website to apply for the free distance Scalar healing and send in their photos - he said he uploads the photographs 2-3 times a day during the treatment process. It does 3 healing modalities daily : 1. Eradicate 400,000 species of germs. 2. Balance the 7 chakras, balance the brain waves. 3. Assemble or form micro nutrients, amino acids and anti-oxidants in the body... everyday for 15 days. Fraz the co-chair gave a testimony of his healing. New member attendee, Mona, had stated her testimony as well. The 45th FESIG Meeting started at 7.30pm BST on Wed 18th Oct.with our FESIG scientist Dr. Elizabeth Donavan! Elizabeth presents papers professionally with her deep knowledge and experience in the field! Consulting on various topics, including alternative energy, she talked about the politics of suppression of knowledge, philosophy and technology. She did a superb presentation of the history of free energy and an outline of a selection of different energy and propulsion technology during the 38th and 41st FESIG Meetings! In this 45th Meeting she presented a talk on 'Politics & Energy' - Implementation of alternative energy technologies and other related ones... She said it interesting that no one wants to address the problem of how to approach the technology. No sooner spoken, something strange happened during the meeting! Some forces tried to stop us from having the meeting... We had to try to restart 3X! There were severe internet interruptions and outages all round. So our Protector, Etienne Charland was called to help! After Etienne finished, the internet connections stabilised enough for us to carry on with the meeting...but not possible to be recorded to be published. The 44th FESIG Meeting started at 7.30pm BST on Wed 4th Oct. with the renowned Patrick J. Kelly, one of the pillars of the study of exotic free energy internationally, speaking, continuing from where he left off at the 42nd FESIG Meeting. Please view our 40th & 42nd FESIG Meeting recordings to catch up with his earlier presentations that continue on with this one. He started off with Les Brown's pyramids and related devices. He then described Charles Flynn’s’ Circuit, the Robert Adams’ effective Motor/Generator, followed by the “Thestatica” Machine Designed by Paul Baumann. He spoke with such knowledge and candor that one feels like being treated to a master class of a blue print of the devices presented! Reference: FESIG3. The meeting was co-chaired with much eloquence by Dr. Fraz Frazzle. The 43rd FESIG Meeting commence at 7.30pm BST on Wed 20th Sept. The Speaker, Mark McCandlish is an internationally-recognized artist, specialized in aviation and conceptual art within the defense and aerospace industries, serving the needs of many of the top American corporations in this regard. Having had literally dozens of UFO sightings since 1966, Mr. McCandlish has spent most of his life trying to discover the science believing there is a plausible answer to interstellar flight without violating the currently-accepted laws of physics. He feels certain that this carefully protected technology has been co-opted by an as-yet-unknown group, and the sequestration of this technology has provided that organization tremendous leverage in world politics, finance and international conflicts over the past five decades. Military-aeronautical Illustrator Mark McCandlish made images of classified projects for the military-industrial complex, especially a drawing of a top secret project that he wasn't supposed to know about - a story of intrigue, secrets, and technology. Detailed information on the history, physics and technological mechanisms regarding faster-than-light travel, antigravity, and zero-point energy. The 42nd FESIG Meeting on the 6th September, 2017, started off with Crystal introducing part of the FESIG Music Video team from Spain (comprising of 3 Germans, 2 Americans, 1 Bulgarian, 1 Venuzuelan & 1 Brit) prior to getting Patrick Kelly started with his presentation. Patrick immediately started off with a disclaimer that this presentation is not to be taken as encouragement to construct anything shown or discussed here as it is for information purposes only. He started off with the Denis Sabourin Generator, commenting of how the inventor assemble the device and how it works… as with the other devices. Followed by Mr. Wilson of Texas who made a self powered wooden flywheel generator for the car. Then Terou Kawai’s Electric Motor – a ring of magnets, Alexkor Aerial System, the Joe Cell technology, The Elmer Grimes 1961 Patented Design For Large Scale Extraction Of Water From Air, The Chas Campbell Generator, The Homopolar Or N-Machine Of Michael Faraday, followed by the some of the 43 devices he prepared to present. Please watch the recording for the details. Patrick will be continuing with the rest of the devices in his next presentation. Dr. Fraz Frazzle co-chaired this meeting with Crystal. This is the public part of the 42nd FESIG Meeting…as we continued with our private meeting after this recording. Crystal reported 'Eliza's Rescue Mission' and relocation and her healing inventions that will be made available for sale from FESIG's site once the prototypes are perfected and market ready. The 41st FESIG Meeting was held on the 16th August, 2017. FESIG alternative energy scientist Dr. Elizabeth Donavan presents papers professionally with her deep knowledge and experience in the field! She did a superb presentation during the 38th FESIG Meeting, and in this 41st meeting she presented some of the most amazing insights on Genetic “reshuffling” eliminating defects and preventing diseases. Age reversal with transmutation of radioactive contamination inside the body, or poisonous elements into harmless ones. Transhumanism becoming obsolete. She talked about the hard science of the Bearden Provisional Patent, also explained the workings of the Heisenberg Compensator. How the genetic probabilities can create a 'shuffling effect' that can eliminate defects and correct for genetic corruption, bringing about the rejuvenation process (The negative time domain reverses everything) and decontaminate nuclear wastes or accidents. Big Pharma will be obsolete, and so is Big Oil, Weapon Technologies and Nuclear Energy! Enormously extended lifespans - IMMORTALITY? Yes! It's within our grasp! There had been reported deactivation of nuclear weapons. We believe there're Breakaway-Societies or Breakaway-Civilisations that helping humanity by deactivating these devastating weapons! Transhumanism is obsolete! Humanity's creative energy is something that cannot be replicated! It is very sought after! Human life will have greater value - Elizabeth will present 'Planetary Engineering" in her next talk at FESIG. Please be on the look out to join us in our live meetings. The 40th FESIG Meeting was well attended by some 17 FESIG members, with full attention to the presentation by renowned Patrick J. Kelly! Originally from Ireland, Patrick is one of the pillars of the study of exotic free energy internationally! He authored an eBook with 26 chapters and published the book titled "The Practical Guide to Free Energy Devices" and keeps it up-to-date. He has painstakingly researched to develop and archived a compendium of free energy information with coverage of historic and contemporary devices for our study reference. It has 3,300 pages (and growing as he updates regularly) and hundreds of devices with Patrick's personal comments on viability. He even illustrated the books himself! Yes, he drew the ‘blue-print’ circuitry diagrams by himself! This work has become the 'school standard reference manual' for free energy scientists, researchers, developers and students alike! He basically explained various designs of free energy technologies, with his feedback as to the usability and efficiency of each one. Pick any model and build it yourself! Patrick covered some of the following with others to continue in another presentation:- 1. Magnet motors - moving drive magnets: Kundel, Don Kelly 2. Magnet motors - Electronic shielding: Flynn 3. Magnet motors - Linear path: Anthony and Adreas 4. Magnet motors - High Power: Diduck magnet motor 5. Magnet motors - Robert Adams motor 6. James Hardy: water jet motor/generator 7. Lawrence Tseung Magnetic Frame 8. Thane Heins Transformers 9. Clemente Figuera Split transformer 10. Barbosa and Leal 172 kilowatts from the ground 11. Colman / Seddon-Gillespie 1 kilowatt 70-year 'battery' 12. Don Smith 1 kilowatt replication. 13. Gravity - Chas Campbell: impulse generator. 14. Gravity - Donnie Watts: Centrifugal amplification. 15. Gravity - Mikhail Dmitriev: Deflected weights 16. Gravity - Veljko Milkovic: Level/Pendulum mechanical amplification. 17. Gravity - David Kwok's 'Hidro' 100 kilowatt buoyancy 18. Gravity - William Skinner: Gravity drive. 19. Electronics - Lawrence Tseung's FLEET system 20. Electronics - Ron Pugh's COP=13 charger 21. Electronics - Alexkor's battery chargers 22. Electronics - Plate aerials: Dragan Kljajic 100 watts 23. Electronics - The TREC aerial 10 kilowatts 24. Passive - Joe Nobel's Joe Cell 25. Passive - The Joe Cell coil: +20% mpg 26. HHO - Zack West's water fuel motorcycle 27. HHO - Bob Boyce's 101-plate electrolyser. 28. HHO - Dave Lawton: Water splitting; 3-phase, 1-phase, auto-tune 29. HHO - Generators on water alone 30. Gravity - Chas Campbell: High-power horizontal. 31. Electronics - South Africa 40-watt continuous. The meeting was chaired by Crystal Goh & Fraz Frazzle. The 39th FESIG Meeting commenced after attendees got into the Zoom Room to get to know each other first so the Chair started the last meeting report and introduced the speakers, Gordon James Gianninoto & his wife Janet Stanley who had space craft and ETs in their dooryard, and in their house. Millions of people around the world have heard her descriptions of visitations with extraterrestrials and her relationship with her 100% human unselfish extraterrestrial Zeta hybrid children. For more than 20 years they have lectured widely on the approach of Planet X, Poleshift, and the aftermath including open contact with benevolent ETs and dimensional or frequency change for Earth. Gordon spoke of ET contact, telepathy, psychic experiences and visions as he describes how we are about to experience Pole Shift – the crust of the planet separating from the core and reattaching that will probably happen in Aug, Dec 2017 or April 2018! He spoke about the real scientists of the galaxies with their propulsion system. He said we are in the Sagittarius Galaxy and NOT the Milky Way! Gordon has been on over 700 broadcast including his own radio shows, satellite, shortwave, and internet radio stations with between 20 and 50 million listeners. 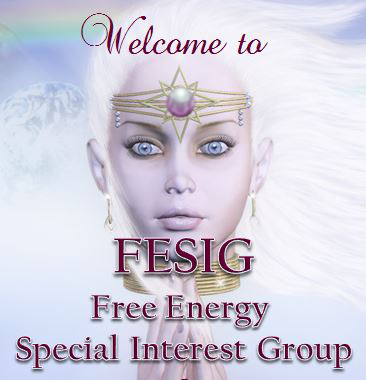 FESIG members joined in the conversation and this meeting was then adjourned to the 40th Meeting on the 2nd Aug with Patrick J. Kelly, renowned author of 'A Practical Guide to Free Energy Devices' speaking. Join us! Write to crystal@truevisionofpeace.com. FESIG 38th Meeting on the 5th July brought many insights into the realm of free energy development from our esteemed top scientist Speaker, Dr. Elizabeth Donavan! Elizabeth, well qualified in electronics, statistical process control, statistical quality control, designed different consumer grade items for various companies. She's into Arduino programming, and is self-taught in CAD and 3D printing, majored in physics and chemistry. Consulting on various topics, including alternative energy, she talked about the politics of suppression of knowledge, philosophy and technology. She did a superb presentation of an outline of a selection of different energy and propulsion technology! She talked about free energy from the middle ages to the 19th Century, Legends in ancient times, Alchemy or Cold Fusion? Bessler Wheel in the 18th Century, John Keely in the 19th Century, Nicola Tesla, 19th & 20th Century, Clark Maxwell –Free Energy from the vacuum. Cover Up begins 20th-21st century… 7000 Patents classified till today. Corporate government octopus classified many energy inventors as terrorists, Homeland Security act is used to harass Inventors. You might kill the inventor BUT not the idea. You can suppress it but you can’t kill it! Now they are going open source thru’ social media. Exodus of Inventors to friendly countries. Then she assessed The Technology - The Trout Turbine – The Searl Effect Generator (SEG) - The Karl Shaeffer Steam Generator – Marcus Reid’s & Laser Hacker’s Crystal Cell – The Atomic Hydrogen Process – The Carbon & Nickel Fusion Systems - Defkarion Hyperean Reactor – Tom Bearden’s Energy Collector – Charles Flynn Transformer – Implosion Transformer - Tesla Switch – The Floyd Sweet : Vacuum Triode Emplifier… Then she went onto Anti-gravity devices. Fraz Frazzle commented on certain devices whilst complimenting Elizabeth on her deep knowledge and experience in the field! The next talk that Eliza will do will be about health : 'A Practical Regeneration' Look out for it! The 37th Meeting started promptly with 13-15 people in attendance. KERRY CASSIDY , the CEO/ Founder of Project Camelot, is a documentary filmmaker/investigative journalist and well known radio talk show host of Project Camelot Whistleblower Radio and Project Camelot TV broadcaster with a weekly live show on Youtube. Her website Project Camelot (projectcamelot.org / projectcamelotportal.com ) is a leader in the alternative media sector, with a Youtube channel that has over 50 million viewers worldwide and over 157,000 subscribers. Kerry travels the world conducting interviews and documenting the testimony of whistleblowers with above top secret clearances as well as authors, researchers and experiencers covering conspiracies, the secret space program, black projects, ETs, kundalini and ascension and free energy. She speaks at conferences around the world and is considered one of the leaders of the disclosure movement. Kerry talked about the 1st whistleblowers from Mars, such as Henry Deacon, Brian O'Leary, the Free Energy activists and inventors. That a lot of the whistle blowers are misleading people unfortunately but those who aren’t probably disappeared after speaking out for awhile. Miles Johnston of the Bases fame in the UK also joined us contributing some superb input on the scalar waves technology in line with the conversation with Kerry and the black goo that he researched on. Scaler wave technology’s positive and negative debate was attempted here, the long wave and short wave of which creating vortexes, used as military weapons. ACIO’s Monarch Solutions was brought up by James. Discussions like this are so valuable – in a round table of whistle blower investigative journalism comparing notes for truth! Kerry testified from her findings that indeed super soldiers’ mission is to defend the sacred grounds and Humanity as that’s their job! And that the SSP Secret Space Program is legit and is dualistic too… Then scientist Elizabeth Donavan explained that Bearden’s Scalar technology for healing does actually work as it was tested so. Etienne ‘connected’ to some information on the Blackgoo… asking the good Blackgoo for the location of the corrupted one so he and his Orion Swat Team can work on the protection front. The 36th FESIG Meeting was held on 7th June '17. Adrian Espinosa of ForceVsPower on Psychic Reconnections and accessing AI Database, showed up just for 15 mins before it started but dropped off just before we started. As Stephane Fyfe came back to FESIG after taking some time off, Crystal got him to speak about his latest update on his devices, whilst Scientist Elizabeth Donavan prompted a dialogue with him on 'the process'. James Rink then gave a great preview introduction of Elizabeth, who will be speaking on 5th July. Christian Lettner did a great presentation of his work on the properties of each metal...Fraz Frazzle joined in with his knowledge too - what a useful mini workshop all can learn from! Piotr Ficner (our Zoom Host) shared some amazing developments on the Free Energy trends with sites and pictures! The FESIG EXCO regulars, Crystal, James Rink, Fraz Frazzle, Ron Crystal, Christian, Piotr Ficner, and others joined in on a panel discussion. Despite the scheduled Speaker's no-show yet again, and still not getting the long awaited Skynet info, this meeting turned out to be an interesting mix of updates along with very important information (not to be missed! ), after all! The 35th FESIG Meeting was held on 17th May although there were obvious forces working against it happening! Dramatic but not frantic! Adrian Espinosa was targeted and 'framed' but was eventually released once found innocent (after our group energy sent proved too much for his perpetrators!). His stand-in Cynthia Boulter was blocked from coming into the meeting and even our own FESIG Protector, Etienne Charland had an internet interference trying to come in to the meeting to fill in for Adrian! The show must go on... so whilst 'holding our supposed speaker, Adrian's hand' from afar sending him prayers, Love and Light, we held our 35th Meeting, amongst ourselves, the EXCO regulars, Crystal, James Rink, Fraz Frazzle, Ron Crystal, Iosif Daniel, Piotr Ficner, Vince, and others. We discussed about the probable release of the Non-Human exotic technologies from the Secret Space Program. Crystal probed into James's knowledge accessed from his association with Peter of the ACIO and his Super Soldiers network, on the demise of the SSP in a couple of years time and what will become of the exotic techs if not to be released open-sourced for humanity? Disclosure and exposure time when secrets are no longer to be kept upon their demise.... Suppression and repression to be lifted once the tables are turned or is it just a 'change of management'? And so Crystal questioned on, whilst James came out with what he knows or was informed. Iosif Daniel asked important geoengineering questions which were answered succinctly by our resident scientist Fraz Frazzle. Watch all of the recording to find out more. The 34th FESIG Meeting held on 3rd May, introduced guest speaker, Michael Upstone Chairman and founder of The Universal Trust. The Universal Trust supports co-operative relationships with partners who share the intent to bring paradigm changing technologies to the world. Mike is a former FTSE 100 management consultant who went on to chair the first international quality guidelines for digital imaging and is a contributor to the Model of Sustainable Organisation - MoSO. MoSO is a holistic model designed to invert common, flawed organisational practice, to create organisations that work with nature and human nature. He explained The Universal Trust has a concept for technology providers and community where notes are printed and denominated (measured) in kilowatt hours – this makes us conscious creators of our own currency, and makes the connection between currency and energy conscious. The details of which is found in this pdf link. FESIG's key members Crystal, James, Fraz, and regular Ron indulged in a deep dialogue with Mike on the practicality of bringing about the new paradigm shift from the old dysfunctional hierarchical monetary incentive model to the the new conscious currency paradigm of abundance and freedom. Thus a meeting of futurist thinkers deliberating on the freedom ideologies! The 33rd FESIG on 26th April was with a surprise guest speaker as the scheduled one, Adrian Espinosa wasn't well. Thanks to James Rink's quick thinking and fast action, he immediately got Jessica Marrocco to fill in for Adrian! Jessica is Beyond Smoke & Mirrors Radio show Co-host at www.paraspeakradio.com. She's a Psychic/Intuitive/Medium, Author, Life coach, Lemurian healer, Celtic shaman, Radio talk host and a futurist. Jessica (Arael) Marrocco http://www.readingsbyarael.com/ In the meeting we discussed free energy devices and technology of the future, the rate of evolution and progress made by humanity in the perspective of the big picture intuitives like Jessica could see... She described what she 'saw' - the metallic alloy used in the space crafts and devices. Crystal asked about the Light body Lightships versus metallic alloyed Space Crafts, what we have to alluringly attract the Alien Controllers here? James Rink gave us an excellent update on the Secret Space Program's future and how they are releasing their free energy technologies to humanity in just a short couple of years when they'll cease their operations! What a disclosure update! Thank you Jessica and James! The 32nd FESIG on the 5th April, started with Crystal, the Chair, introducing James Gilliland of the famed ECETI Ranch, FESIG’s special guest speaker. James, Founder of ECETI or Enlightened Contact with Extraterrestrial Intelligence, is a minister, counselor, an internationally known lecturer, best selling author with the books: Reunion with Source, Becoming Gods, and The Ultimate Soul Journey. Listen to his latest radio show published 27th March 2017, J. Gilliland & Michael Salla ~ ET, Nazis & Navy Build Space Fleet, NESARA, New Republic & Liberation. James G started off with acknowledging the fact that most of our free energy technologies are from the ETs. He talked about his Ranch which is the portal or ‘gateway’ to the ETs and how the benevolent ones are usually from the 5th Dimension and above – how evolved they are and how keen they are to help us through the process of transitioning from the 3rd density to the 5th. James Rink discussed the secret space program with James G and Crystal brought up the subject of ascension for humanity, either via technology assistance or just simply the natural time coded process of the activation of the dormant DNA codes embodying the higher self. Crystal revealed her idea of organizing a mini conference in the ECETI Ranch sometime in August, FESIG on Free Energy technologies in collaboration with James Rink’s SuperSoldierTalk.com’s Secret Space Program and ECETI.org’s ET Connection. This is a super charged meeting with our last speakers Kevin Hay & Dr. Whodini, William Alek in attendance, adding to equation as well. Fraz Frazzle succinctly summed up the session in a superb closing statement. Click Here to continue to read all Past Meeting Reports right to the beginings of FESIG. The Innovators of Plasma Technology who had taught indirectly and directly in FESIG. Crystal Goh, founder and host of FESIG acknowledges Martin Burger for his Philanthropic Vision. Dr. Elizabeth Donavan & Dr. Fraz Frazzle for helping out regularly with dedication. Piotr Ficner, James Rink, Etienne Charland, Patrick Kelly, David Alistair Baines, David Palfreman, who have contibuted to FESIG in their own capacity (in kind) or with gifts and donations. Many thanks to the rest of the EXCO members for their support in the meetings, council advisors, teachers, presenters, speakers who have taught and presented or shared knowledge here without whom FESIG would not be in good steed and service to all in pursuit of a better world to live in. Crystal Goh, The Chair. FESIG's Founder is a Business Consultant in London, UK, a Consciousness Activist, Mind Mastery Coach and a Free Energy enthusiast who has built Plasma devices. James Rink - South Carolina, US.. Former SuperSoldier James works around the programming and trauma he has been forced to endure and help others do the same in supersoldiertalk.com He developed his “Neo Meditation Device” which is a chi energizer & relaxation device. Fraz Frazzle, PhD, US. FESIG's Chief Scientist & Plasma Technologist. Click here for his papers : 1. NanoCoating & Blow Off, 2. Multimeter News, 3. Introduction to GANs 4. GANs & Salt. Martin Burger, Visionary Philanthropist. Canada CEO – Founder of Blue Eagle Inc., Founding CEO of Octan Resources Inc. & Blue Energy Canada. Elected Fellow with the World Innovation Foundation. Executive, design engineering and construction expertise. Iosif Daniel, London, UK - A futurist thinker with an electronics & scientific background, former Plasma Technology Developer. Etienne Charland, Canada & Mexico - Etienne is a clairvoyant self-transformation specialist, metaphysician. He brings disclosure, ready to serve Humanity. Access Etienne's Spritual Self Transformation website & Facebook. Elizabeth Donavan, PhD, Spain.Author of 5 SmashWords published Books. Her Smashwords interview. Alternative Energy Scientist. Skilled in physics, chemistry. electronics, Arduino programming, CAD & 3D printing. Pontus Hassbjer of Sweden - FESIG Facebook & Youtube Manager. Plasma Technology Developer. A dynamic social media networker. Ron Crystal, a retired Homeland Security Deputy Sheriff , is an avid knowledge seeker and researcher of the Ascension phenomenon, also following free/alternative energy progression. Very knowledgeable, he has a good source of reference handy for FESIG when needed. Most meetings have been recorded and there are many pictures and diagrams to be organised and posted in a Members Resource page if we can have volunteers to help out Crystal in the admin. Click the links below to view other pages with videos our our past meetings. FESIG Meeting Video Links, Part 5: FESIG 63rd Meeting with Jared Rand on Celestial Chamber & Pontus Hassbjer's making of the Buie-Morin Motor Generator. Please note that the program schedule time is in GMT and EST (Eastern Daylight Time, US), do your own time conversion and be on time! The idea of getting together in a group to learn, create and make our own free energy & healing devices is not only a great idea, it is essential! FESIG, serving as a convergent centre of free energy enthusiasts physically in South London to start off with, does not mean the rest of the world cannot participate. Whilst we're at it live, you can join in as well in a live webcast via Zoom - live streaming for the 2-hr meeting, seminar or sometimes, just a casual gathering to share knowledge and skills. Please consider a donation to sustain this exclusive group and network with other free or alternative energy groups in the world to co-create a futuristic life of freedom and joy! A donation is necessary to ensure sustainability and commitment for all members.